Humans are designed to stand and walk erect, with our spine supporting us in the upright position. As we walk (barefoot) around the uneven surface of the Board, maintaining our upright posture with an ‘easy tallness and openness’ around the chest, the entire body is strengthened. This also helps avoid the damage resulting from the poor postural habits of slumping and straining. People who walk, and ‘walk well’, using the body’s natural walking mechanisms and maintaining the correct upward posture, are healthier and enjoy far higher levels of energy and well-being than those whose lives are more sedentary. Using all the joints of the legs enhances flexibility in feet, ankles, knees, hips. This, along with the natural swing of the arms, enhances circulation and healthy heart rate, stimulating internal organ systems, natural breathing and movement patterns. This naturally promotes healthy energy levels for body and mind. 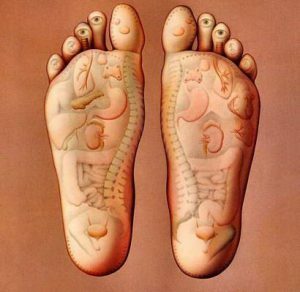 The human body is totally interconnected. Actively walking on the Board then not only stimulates the soles of the feet, but through them, the ‘meridians’ or ‘channels’ of the body. As the user walks on the Board, making this a period for feeding in positive, constructive thoughts, attending to his/her relaxedness, flexibility, good breathing, good posture, and overall physical and emotional wellbeing, the Board becomes an effective tool for holistic healthiness. With your own Board, you can achieve all this in just a few minutes a day in the safety, comfort and convenience of your own home. EVERY FAMILY/HOME/OFFICE should have a Resident Healthboard!